Nurses believe medical errors could be reduced if the medical devices hospitals rely on for testing, monitoring and treating patients could seamlessly share information, according to the newly released results of a national survey of more than 500 nurses conducted online by Harris Poll on behalf of the Gary and Mary West Health Institute. 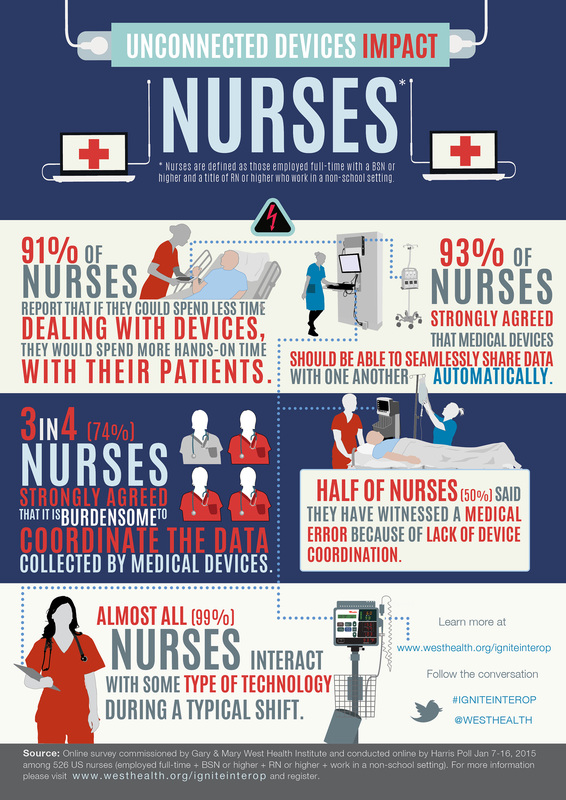 How do unconnected devices impact nurses? See the West Health Institute’s infographic. 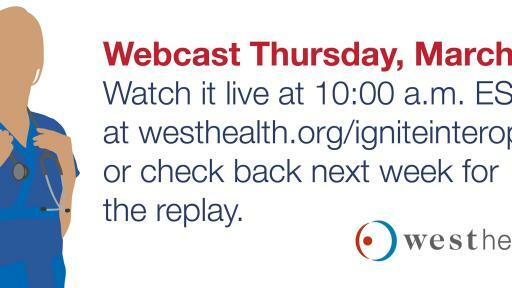 View the March 12 webcast with healthcare leaders on patient safety – replay next week. 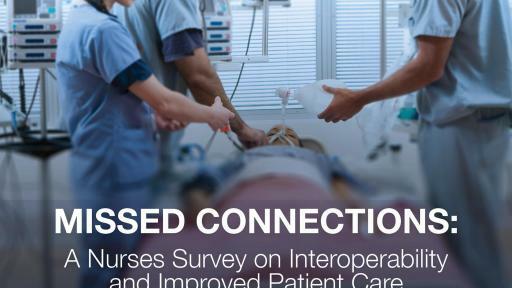 Download “Missed Connections: A Nurses Survey on Interoperability and Improved Patient Care”. Each year, it is estimated that more than 400,000 Americans die from preventable medical errors. This not only takes an enormous emotional toll on families and friends, but also places a heavy economic burden on the nation — an estimated trillion dollars or higher. As hospitals wage a war on error, there is growing appreciation that medical devices, while individually safe and effective at improving care and saving lives, can create risks for patients and challenges for clinicians when not seamlessly connected. According to the survey, half of these nurses said they witnessed a medical error resulting from a lack of coordination among medical devices in a hospital setting. Devices include everything from infusion pumps, ventilators, pulse oximeters, blood pressure cuffs to electronic health records. The weighted survey was conducted online by Harris Poll from January 7–16, 2015 and included 526 nurses (credentialed at RN or higher and with an education of BSN or higher) who work full–time in a non–school setting. 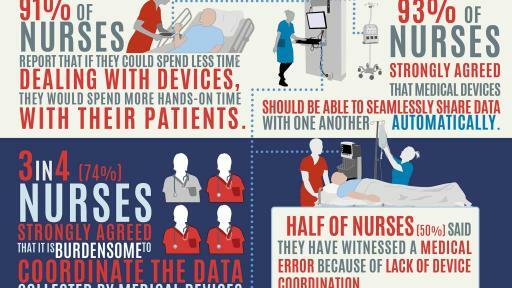 Among these nurses, three in five (60 percent) said medical errors could be significantly reduced if medical devices were connected and shared data with each other automatically. This problem could be addressed by the widespread adoption of open communications standards that allow for the safe and secure exchange of data. Medical device interoperability, the ability to safely share health information across various technologies and systems, could provide important benefits such as enhanced patient safety and better clinical outcomes at a lower cost. The West Health Institute has estimated that a system of connected devices could potentially save more than $30 billion each year by reducing redundant testing, manual data entry and transcription errors. According to the survey, “Missed Connections: A Nurses Survey on Interoperability and Improved Patient Care,” nearly half of these nurses (46 percent) said an error is extremely or very likely to occur when information must be manually transcribed from one device to another. “I have seen many instances where numbers were incorrectly transcribed or put in reverse or put in the wrong column when typed manually, which can cause errors,” said one nurse who participated in the anonymous poll. But perhaps even more important, transcribing data “takes way too much time for the nurses to adequately care for the patient,” one nurse responded. Many of these nurses agreed, with more than two out of three (69 percent) saying manually transcribing data is very likely to take time away from patients who need attention. The survey, funded by the nonprofit, non–partisan Gary and Mary West Health Institute, was conducted online by Harris Poll from January 7–16, 2015 on the Institute’s behalf. It included 526 nurses (credentialed at RN or higher and with an education of BSN or higher) who work full–time in a non–school setting. Participants were queried about the positive and negative aspects of working with medical technology. Respondents, whose identities are confidential, were selected from among those who have agreed to participate in Harris Poll Surveys. For complete survey methodology, including weighting variables, please contact Tim Ingersoll at tpingersoll@westhealth.org. Please visit http://www.westhealth.org/igniteinterop to read an issue brief of the survey’s findings. The Gary and Mary West Health Institute is an independent, nonprofit medical research organization that works with healthcare providers and research institutions to create new, more cost–effective ways of delivering high–quality care. We’re wholly funded by philanthropists Gary and Mary West as part of West Health, which includes the Gary and Mary West Health Policy Center, a nonprofit, non–partisan resource in Washington, D.C. that provides education, expertise and policy proposals to transform the American healthcare experience. Together we are pioneering new and smarter technologies, policies and practices to make high–quality healthcare more accessible at a lower cost to all Americans. For more information, find us at www.westhealth.org and follow us @westhealth. 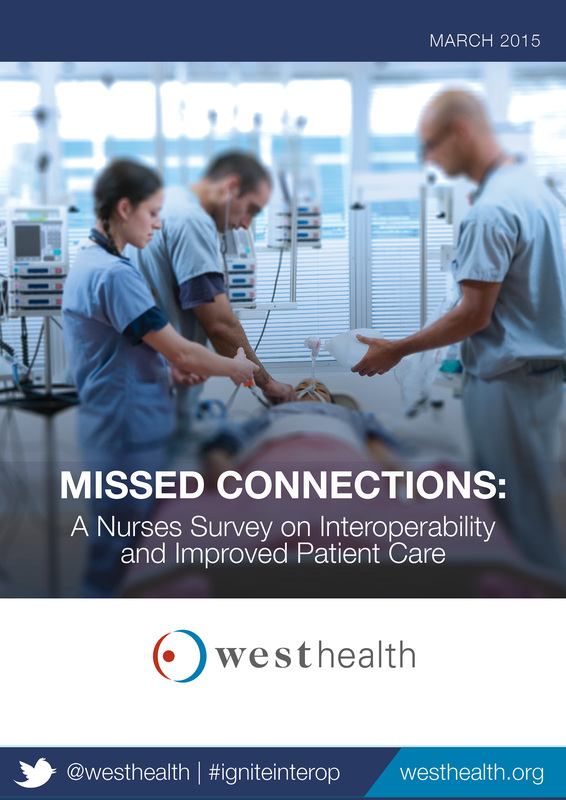 Download the issue brief of MISSED CONNECTIONS: A Nurses Survey on Interoperability and Improved Patient Care from the West Health Institute.